There are many great restaurants and eateries within walking distance. Below is a short description of each. It’s a good idea to make reservations for most of them and we will be happy to make them for you, just ask! Elegant mainstay features seasonal French inspired cuisine and local wines in a Victorian farmhouse. A hallmark of Café Beaujolais’ cooking is the use of organically grown produce. In addition, most of our meat, poultry and eggs come from animals humanely raised in a free-range environment without chemical-supplemented feed. As for the sea’s harvest, our purveyors often provide locally line-caught or farmed seafood. Despite its off-the-beaten-path address, this longtime Mendocino “locals’ secret” draws them in with “creative”, reasonably priced New American-French fare and a staff overseen by husband-and-wife “owner-operators”;additionally, “no one is in a hurry” here, which always makes for a “relaxing atmosphere”in the “peaceful and beautiful” setting. Trillium Cafe is located right in the middle of Mendocino village. Our restaurant is beautiful and cozy, with a fire place and ocean views. When the weather permits, we have our outside deck open, which has ocean views of Big River Bay, and our beautiful culinary flower garden. (707) 937-2422 Located at 10451 Lansing St.
Small eatery with inside and deck seating, water views, serving an eclectic menu of Thai-inspired cuisine. Serving the local and global community international cuisine composed of organic ingredients healthy for the planet and our customers. (707) 937-0289 Located at 45020 Albion St. Upscale California dining in a Victorian setting with ocean views. (707) 937-3569 Located upstairs at the water tower 45040 Main St.
California cuisine of organic meats and vegetable, craft cocktails highlighting sustainable, peak-season ingredients. Offering local, organic meats & vegetables blended to perfection, as well as many vegan and gluten free options. Dine in bliss with breathtaking coastal views from our outdoor patio or indoor dining room. (707) 937-4782 Located at 10485 Lansing St.
1) Explore the coastline – Sheer bluffs rising from a rocky shoreline, crashing waves, unique rock formations and sandy beach coves. A must see for all visitors, whether walking, bicycling or viewing from the car. State Parks dot the coastline and provide access for viewing, excellent hiking trails and information on the local habitats. Our favorites are the Mendocino Headlands State Park and Russian Gulch State Park. 2) Mendocino Art Center – Local artists create, teach, exhibit, and preserve art; and cultivate a vibrant regional arts environment to ensure access to all people, enrich each visitor’s experience, and preserve the community’s artistic heritage. 3) Mendocino Coast Botanical Gardens – 47 acres of gardens stretching to the coastal bluffs. Featuring many different garden areas such as the Heritage Rose Garden, the Mediterranean Garden, the Woodland garden, Heaths and Heathers garden. Bring a picnic basket or get lunch at Rhodies. Open year round. 4) Museums – Kelly House Museum and Ford House Museums – See the Kelley House as it existed in the 1860’s and learn about the rich history of Mendocino. Walking tours: Take a guided tour around the village and learn about the history of the coast and town, the mills and the artists. 5) Local Theater Companies– Mendocino Theater Company and Gloriana Musical Theater, both offering rich live entertainment year round. 6) The lighthouses! Point Cabrillo Lighthouse and Point Arena Lighthouse are both nearby. Tour the lighthouses and learn their history. 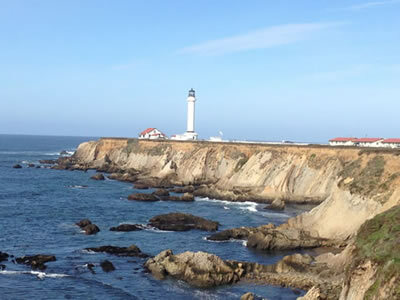 Point Cabrillo State Park includes 300 acres of an impressive variety of wildlife and hiking trails. 7) Horseback riding – Join a group or reserve a private trail ride on the beach or through the redwoods with Ross Ranch Horseback Rides. 9) Skunk Train – All Aboard the famous Skunk Train! Nostalgia rings down the line in the sights, sounds and smell of trains moving through the wild. Rides run through the redwoods between Fort Bragg and Willits. 10) Noyo Harbor – Charter fishing and whale watching boats can be found at Noyo Harbor as well as great fresh fish and seafood at this working harbor. Sunsets from this vantage point are often spectacular. Mendocino Facts and Trivia ... Read On! Mendocino (formerly, Big River, Meiggstown, and Mendocino City) is an unincorporated community in Mendocino County, California, United States. Mendocino is located 9.5 miles (15 km) south of Fort Bragg, at an elevation of 154 feet (47 m).The population is approximately 900. The town’s name comes from Cape Mendocino, named by early Spanish navigators in honor of Antonio de Mendoza, Viceroy of New Spain. Despite its small size, the town’s scenic location on a headland surrounded by the Pacific Ocean has made it extremely popular as an artist colony and with vacationers. According to the United States Census Bureau, the CDP has a total area of 7.4 square miles (19 km2), of which, 2.3 square miles (6.0 km2) of it is land and 5.2 square miles (13 km2) of it (69.58%) is water. Mendocino experiences a cool summer Maritime Mediterranean climate. Summers are characterized by frequent fog and highs mostly in the upper sixties and lows in the fifties. Winters rarely, if ever, see frost or snow, due to close proximity to the Pacific Ocean. Mendocino averages about 43 inches of rain per year concentrated mainly in fall, winter, spring, and early summer. Many films and movies have been filmed in and around Mendocino and Mendocino County, including Dying Young, The Russians Are Coming; Overboard; The Dunwich Horror; The Karate Kid, Part III; Dead & Buried; Forever Young; Same Time Next Year; Racing with the Moon; Pontiac Moon; and The Majestic. Mendocino was depicted as turn-of-the-20th-century Monterey in the James Dean classic East of Eden, and it served as a New England resort town in Summer of ’42 (the latter film featuring numerous local Mendocino High School students as extras). However, the TV series Murder, She Wrote has had the largest impact on the community.Nine episodes of the 264-episode program were filmed in Mendocino, while exterior shots throughout Mendocino were used in the remaining episodes. The program was broadcast for 12 seasons, from September 1984 until May 1996, and won many awards. Many local residents looked forward to the yearly filming, as over a hundred and fifty were chosen to play background parts. A lucky few were cast for speaking roles. Murder, She Wrote also brought in more money to the town due to increased tourism — by some estimates, around $2,000,000. The local high school band appeared in one of the episodes and received enough money from the appearance to go on a band trip. Mendocino is also the home of the Mendocino Film Festival which was first held in May 2006. Because the area is a haven for artists, the festival honors them with a special “artist category”, in addition to the documentary, feature and short film categories. See what’s going on now! Present day Mendocino has a strong commitment to the arts with the focal point being the Art Center, three blocks from the Inn. The Center and its Showcase gallery on Main Street display the works of the students and graduates of its programs. Offering a wide variety of classes, workshops, festivals, fairs and entertainment to the public, the Center is the cultural hub of the North Coast. Mendocino hosts numerous private galleries as well, which offer a wide selection of local artists and media, including paintings, wood carvings and furniture, wire sculpture, ceramics and weaving, to mention but a few. The performing arts also play an important role in the life of the Mendocino community year-round. The Mendocino Theater Company, Gloriana Opera Company, Mendocino Dance Series, and The Mendocino Music Festival are a few of the groups providing a wealth of entertainment and cultural activity. There are many fine restaurants in Mendocino which offer creative and gourmet meals. Food for every taste is offered in a variety of interesting and intimate settings, from French to California cuisine. A person could spend a full week in Mendocino and eat at a different restaurant every night, each with a wonderful selection on the menu. The Joshua Grindle Inn has a book complete with menus from all the best restaurants in the area, and our innkeepers are delighted to make lunch or dinner recommendations and reservations. Mendocino is not only a special place because of its fine galleries and restaurants, but also known for the jewel-like quality of the scenery and its “small town” culture. The village is set on the edge of a rugged coastline overlooking a wide expanse of the Pacific Ocean. To the west, the view is of the headlands and ocean, and to the east is dense redwood forest. Mendocino has been called a “magical… gentle place” (San Diego Union-Tribune, June 8, 1992). The small-town atmosphere is both relaxing and reassuring. People on the street are happy to recommend a favorite restaurant, to tell you about a great place to shop or even, where to watch the seals. If you are returning ... welcome back! If this is your first venture to Mendocino, you will most certainly be amazed!